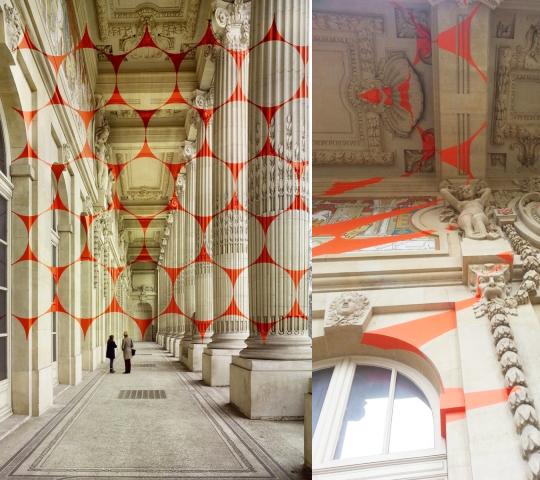 The orange-red geometric markss painted on one arcade of Paris’ Grand Palais. This curious paint is one of the latest geometric perspective work of the Swiss Artist Felice Varini. Amazing that it looks like the paint is floating and isn’t attached to the building. “Twenty-three discs, twelve hollowed halves and four quarters” is created aspecially for the Grand Palais exhibition Dynamo, showing a Century of Light and Motion in Art (1913-2013). Showing the work of 30 amazing artists.. See the show untill 22 July.